The Macgilivrays were one of the oldest and most important of the septs of clan Chattan, and from 1626, when their head, Ferquhard MacAllister, acquired a right to the lands of Dunmaglass, frequent mention of them is found in extant documents, registers, etc. Their ancestor placed himself and his posterity under the protection of the Mackintoshes in the time of Ferquhard, fifth chief of Mackintosh, and clan have ever distinguished themselves by their prowess and bravery. One of them is mentioned as having been killed in a battle with the Camerons about the year 1330, but perhaps the best known of the heads of this clan was Alexander, fourth in descent from the Ferquhard who acquired Dunmaglass. This gentleman was selected by Lady Mackintosh to head her husband's clan on the side of Prince Charlie in the '45. He acquitted himself with the greatest credit, but lost his life, as did all his officers except three, in the battle of Culloden. In the brave but rash charge made by his battalion against the English line, he fell, shot through the heart, in the centre of Barrel's regiment. His body, after lying for some weeks in a pit where it had been thrown with others by the English soldiers, was taken up by his friends and buried acorss the threshold of the kirk of Petty. His brother William was also a warrior, and gained the rank of captain in the old 89th regiment, raised about 1758. One of the three officers of the Mackintosh battalion who escaped from Culloden was a kinsman of these two brothers - Farquhar of Dalcrombie, whose grandson, Neil John M'Gillivray of Dunmaglass is the present head of the clan. The M'Gillivrays possessed at various times, besides Dunmaglass, the lands of Aberchallader, Letterchallen, Largs, Faillie, Dalcrombie, and Davoit. It was in connection with the succession to Faillie that Lord Ardmillan's well known decision was given in 1860 respecting the legal staus of a clan. Excellent MacGillivrays of the Doune". BADGE: Los nam braoileag (vaccineum vitis idea) red whortle berry. SLOGAN: Loch Moy, or Dunma�glas. PIBR0CH: Spaidsearachd Chlann Mhic Gillebhr�th. MR GEORGE BAIN, the historian of Nairnshire, in one of his many interesting and valuable brochures, The Last of Her Race, recounts a tradition of the battle of Culloden which was handed down by members of an old family of the district, the Dallases of Cantray. At the time of the last Jacobite rising, it appears, two beautiful girls lived in the valley of the Nairn. At Clunas, a jointure house of Cawdor, high in the hills, lived Elizabeth Campbell, daughter of Duncan Campbell of Clunas. She was a highly accomplished young woman, having been educated in Italy, whither her father had fled after taking part in the Jacobite rising of 1715, and she was engaged to be married to young Alexander MacGillivray, chief of the clan of that name. Anna Dallas of Cantray, on the other hand, was a daughter of the chief of the Dallases, and her home was the old house of Cantray in the valley of the Nairn below. She likewise was engaged to be married, and her fianc� was Duncan Mackintosh of Castleledders, a near relative of the Mackintosh chief. These were said to be the two most beautiful women in the Highlands at the time. Old Simon, Lord Lovat, who, with all his wickedness, was well qualified to criticise, is said to have declared that he did not know which was the more dangerous attraction, " the Star on the Hilltop," or "the Light in the Valley." There was doubtless something of a rivalry between the two young women. Now, Angus, chief of the Mackintoshes, was on the Government side, and in his absence his wife, the heroic Lady Mackintosh, then only twenty years of age, had raised her husband�s clan for Prince Charles. On the eve of the battle of Culloden it was thought that Mackintosh of Castleledders might lead the clan in the impending battle. That night, however, Elizabeth Campbell told her fianc� that unless he led the Mackintosh clan for the Prince on the morrow, he need come to see her no more. The young fellow accordingly hurried off to Moy Hall, and told "Colonel " Anne, as the pressmen of that time called Lady Mackintosh, that the MacGillivrays would not fight on the morrow unless he was in command of the whole Clan Mackintosh. Now the MacGillivrays were only a sept of the clan, though the mother of Dunmaglass was descended from the sixteenth Mackintosh chief, but they made a considerable part of the strength of Clan Mackintosh. Lady Mackintosh, therefore, became alarmed, sent for Castleledders, and begged him for the sake of the cause which was at stake to forego his right, as nearest relative of its chief. to lead the clan on this occasion. Moved by her entreaty he agreed, with the words, " Madam, at your request, I resign my command, but a Mackintosh chief cannot serve under a MacGillivray"; and accordingly he went home and took no part in the battle. Next day, it is said, the heart of Elizabeth Campbell was filled with pride when she saw her sweetheart, Alexander MacGillivray, yellow-haired young giant as he was, marshalling the Mackintoshes 700 strong in the centre of the Prince�s army, and it is said she rode on to the field to congratulate him. The Prince noticed her, and asked who she was, and, on being told, remarked that MacGillivray was a lucky fellow to have so beautiful and so spirited a fianc�e. Alas! a few hours later young MacGillivray lay dying on the field. His last act, it is said, was to help a poor drummer boy, whom he heard moaning for water, to the spring which may still be seen at hand, and which is known to this day from the fact as MacGillivray�s or the Dead Men�s Well. There he was found next morning, his body stripped by the cruel Hanoverian soldiery, and it was remarked what a beautiful figure of a young fellow he was. His body was buried in the Moss where it lay, and six weeks later, after the English had gone, when it was taken up, to be buried under the doorstep of the kirk of Petty, people marvelled that it was still fresh and beautiful, and that his wounds bled afresh. Young as he was, Dunmaglass had played his part splendidly in the battle. In the furious attack which he led, the Mackintoshes almost annihilated the left wing of the Duke of Cumberland�s army, and before he fell, with four officers of his clan, MacGillivray himself encountered the commander of Barrel�s regiment, and struck off some of his fingers with his broadsword. Next day, in the streets of Inverness, this commander met a private soldier wearing MacGillivray�s finely embroidered waistcoat, and, recognising it, indignantly stopped the man, and ordered him to take it off. "Yesterday," he said, "on the field of battle I met the brave man who wore that waistcoat, and it shall not be thus degraded." The waistcoat, however, must afterwards have been lost or again stolen, for it is recorded that it was observed exposed for sale in the window of a tailor in Inverness. Such was the family tradition of the Dallases accounting for the fact that Dunmaglass led the Mackintoshes at Culloden. But it must be remembered that he had seen foreign service and had led the clan from the first, meeting the Prince at Stirling with seven hundred men at his back on Charles�s return from England, and commanding the regiment at the battle of Falkirk. Meanwhile poor Elizabeth Campbell, though her ambition had been gratified, was stricken to the heart. Her big beardless boy lover�he was six feet five inches in height�with light yellow hair, and a complexion as fair and delicate as any lady�s�was dead, and he would indeed come to see her no more. A few months afterwards she died of a broken heart. On the other hand, Anna Dallas had lost her father. The chief of the Dallases was killed in the battle by a bullet through the left temple. But she married her lover, Duncan Mackintosh of Castleledders, and their son, Angus, by and by, succeeded as chief of the Mackintoshes and the great Clan Chattan. Of the MacGillivrays it may be said, as was said of the great house of Douglas, that no one can point to their first mean man. A tradition recorded by Browne in his History derives the name from Gillebride, said to have been the father of the great Somerled. But of the origin of the family nothing is known definitely except that so far back as the thirteenth century the ancestor of the race, one Gilbrai, Gillebreac, or Gillebride, placed himself and his posterity under the protection of Ferquhard, the fifth Mackintosh chief. The name MacGillivray probably means either "the son of the freckled lad," or "the son of the servant of St. Bride." In any case, for some five centuries, down to the last heroic onset on the field of Culloden, just referred to, the MacGillivrays faithfully and bravely followed the "yellow brattach," or standard, of the Mackintoshes, to whom they had allied themselves on that far-off day. An account of the descent of the race of Gilbrai is given in the history of The Mackintoshes and Clan Chattan by Mr. A. M. Mackintosh�one of the best and most reliable of the Highland clan histories extant. Mr. Mackintosh quotes the Rev. Lachlan Shaw�s History of the Province of Moray, the Kinrara Manuscript of 1679, and various writs and documents in the Mackintosh charter-chest at Moy Hall, and his account is not only the latest but the most authoritative on the subject. The first of Gilbrai�s descendants to attain mention is Duncan, son of Allan. This Duncan married a natural daughter of the sixth Mackintosh chief, and his son Ivor was killed at Drumlui in 1330. A hundred years later, about the middle of the fifteenth century, the chief of the MacGillivrays appears to have been a certain Ian Ciar (Brown). At any rate, when William, fifteenth chief of the Mackintoshes, was infefted in the estate of Moy and other lands held from the Bishop of Moray, the names of a son and two grandsons of this Ian Ciar appear in the list of witnesses. Other Mackintosh documents show the race to have been settled by that time on the lands of Dunmaglass (the fort of the grey man�s son), belonging to the thanes of Cawdor. Ian Ciar was apparently succeeded by a son, Duncan, and he again by his son Ferquhar, who, in 1549, gave letters of reversion of the lands of Dalmigavie to Robert Dunbar of Durris. Ferquhar�s son, again, Alastair, in 1581 paid forty shillings to Thomas Calder, Sheriff-Depute of Nairn, for " two taxations of his �4 lands of Domnaglasche, granted by the nobility to the King." It was in his time, in 1594, that the MacGillivrays fought in the royal army under the young Earl of Argyll at the disastrous battle of Glenlivat. Alastair�s son, Ferquhar, appears to have been a minor in 1607 and 1609, for in the former of these years his kinsman Malcolm MacBean was among the leading men of Clan Chattan called to answer to the Privy Council for the good behaviour of Clan Chattan during the minority of Sir Lachlan Mackintosh its chief; and in the latter year, when a great band of union was made at Termit, near Inverness, between the various septs of Clan Chattan, responsibility for the " haill kin and race of the Clan M�Illivray" was accepted by Malcolm MacBean, Ewen M Ewen, and Duncan MacFerquhar, the last-named being designated as tenant in Dunmaglass, and being probably an uncle of young Ferquhar MacGillivray. This Ferquhar, son of Alastair, was the first to obtain heritable right to Dunmaglass, though his predecessors had occupied the lands from time immemorial under the old thanes of Cawdor and their later successors, the Campbells. The feu-contract was dated 4th April, 1626, and the feu-duty payable was �16 Scots yearly, with attendance on Cawdor at certain courts and on certain occasions. Ferquhar�s eldest son, Alexander, died before his father, and in 1671 his three brothers, Donald, William, and Bean MacGillivray, were put to the horn, with a number of other persons, by the Lords of Justiciary for contempt of court; at the same time Donald, who, three years earlier, had acquired Dalcrombie and Letterchallen from Alexander Mackintosh of Connage, was designated tutor of Dunmaglass, being probably manager of the family affairs for his father and his brother, Alexander�s son. Alexander MacGillivray had married Agnes, daughter of William Mackintosh of Kyllachy, and his son Farquhar, was in 1698 a member of the Commission against MacDonald of Keppoch. Three years later he married Amelia Stewart. Farquhar, his eldest son and successor, was a Captain in Mackintosh�s regiment in the Jacobite rising of 1715, while the second son, William, was a Lieutenant in the same regiment and was known as Captain Ban. Their kinsman, MacGillivray of Dalcrombie, was also an officer, and, among the rank and file forced to surrender at Preston, and executed or transported, were thirteen Mackintoshes and sixteen MacGillivrays. It was Alexander, eldest son of the last-named Farquhar, who, having succeeded his father in 1740, commanded the Mackintosh regiment and fell at Culloden as already related. Among those who fell with him on that occasion was Major John Mor MacGillivray. It was told of him that after the charge he was seen a gunshot past the Hanoverian cannon and killed a dozen men with his broadsword while some of the halberts were run through his body. Another clansman, Robert Mor MacGillivray, kjlled seven of his enemies with the tram of a peat cart before he was himself overpowered and slain. The young chief, Alexander MacGillivray, was succeeded by his next brother, William, who, in 1759, became a captain in the 89th Regiment, raised by the Duchess of Gordon. He served with that regiment, mostly in India, till it was disbanded in 1765. His next brother, John, was a merchant at Mobile, and a loyalist colonel in the American Revolution. With his help William added to his family estate the lands of Faillie, and half of Inverarney, with Wester Lairgs and Easter Gask, the two last having previously been held on lease. His son, John Lachian MacGillivray, succeeded not only to the family estates but to the property of his uncle, Colonel John, the wealthy Mobile merchant. As a young officer in the 16th Light Dragoons, he had been given to much extravagance, but on inheriting his uncle�s money he was able to clear the estate of debt. At his death, however, in 1852, he left no family, and the chiefship devolved on the representative of Donald of Dalcrombie, the tutor of Dunmaglass in the seventeenth century. The tutor�s grandson, Donald, was one of those murdered in cold blood by the Hanoverian soldiery after Culloden, but his son Farquhar, also an officer of the Mackintosh regiment, survived the battle. He married Margaret, daughter of AEneas Shaw of Tordarroch, and it was his son John who, in 1852, succeeded to Dunmaglass and the chiefship. This succession was disputed by a kinsman, the Reverend Lachlan MacGillivray, descended from William MacGillivray of Lairgs, brother of Donald, the tutor, the question being whether Donald, the tutor, or his brother William of Lairgs, had been the elder. In 1857 the court decided in favour of Donald and his descendants. Two years before this, however, John MacGillivray had died. He had been a well-known man in Canada, where he was a member of the Legislative Council. The eldest of his four sons, Neil John, found himself in financial straits, and after selling Wester Lairgs and Easter Gask, took steps to dispose of Dunmaglass itself, and the rest of the property which had been possessed by his family from time immemorial. His eldest son, John William, born in 1864, is the present chief of the MacGillivrays. The ancient property of this family lies about the sources of the river Farigaig in Stratherrick. When the Thane of Cawdor, in 1405, procured an act incorporating all his lands in Inverness and Forres into the shire of Nairn, Dunmaglass was part of the territory included. It forms an oblique parallelogram about seven miles long and sixteen square miles in extent. In "the forty-five" the chief�s own followers numbered about eighty men. Besides the family of Dunmaglass and its following there was in the Island of Mull a sept of the MacGillivrays which took its name from the residence of its head and was known as "Og Beinn-na-gall." They were believed to have been descended from the main stem in Lochaber, and to have been dispersed after the discomfiture of Somerled, Lord of the Isles, in 1164. They were also known under the name of MacAngus, or Maclnnes. In the line of ancestors from whom these island clansmen claimed descent was a certain Martin MacGillivray, a parson of about the year 1640. 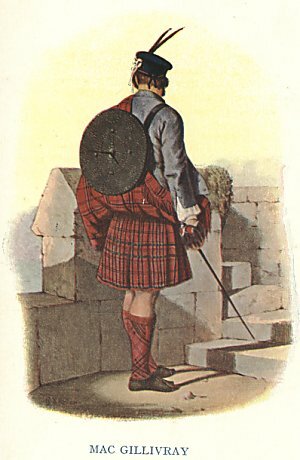 This individual, according to Logan, author of the letterpress of MacIan�s Clans of the Scottish Highlands, was in the habit of carrying a sword. Upon one occasion he happened to call on a son of MacLean of Lochbuie for part of his stipend. The latter refused to pay, and asked whether his visitor meant to enforce his demand with his sword. "Rather than lose what is my due," answered MacGillivray, " I shall use my weapon, and I am content to lose the money if you can put my back to the wall." In the upshot, however, he quickly brought his opponent to his knees, and the latter thereupon gave in, paid the amount due, and declared that he liked well to meet a man who could maintain his living by the sword. Another anecdote of this house is told by the same writer. At the battle of Sheriffmuir, in 1715, he says, the Laird of Beinn-na-gall happened to stumble, whereupon a friend standing near, thinking he was shot, cried out, "God preserve ye, MacGillivray! " He was no doubt startled by the reply, " God preserve yourself," exclaimed Beinn-na-gall, " I have at present no need of His aid." These island MacGillivrays or Maclnneses, however, followed, not the chiefs of Clan Chattan, but the MacDougal Campbells of Craignish, as their chiefs. Details regarding them are to be found in Cosmo Innes�s Early Scottish History and in Skene�s Highlanders of Scotland. Septs of Clan MacGillivray: Gilory, MacGillivour, MacGilroy, MacGilvra, MacGilvray, Macilroy, Macilvrae. The clan MacGillivray is said originally to have come from Morven, Mull and Lochaber and is one of the oldest branches of the Clan Chattan confederation. The founder of the clan is said to be Gillivray who c.1268 put himself under the protection of Farquhar Mackintosh, the 5th chief of the Mackintoshes. Later the MacGillivrays settled further north in Dunmaglass east of Inverness-shire where they took heritable right from the Campbells of Cawdor in 1326. Here the clan appears to have been more successful and increased their possessions ans influence in that area. In the Jacobite risings of 1715 and 1745 the MacGillivrays took a prominent role. 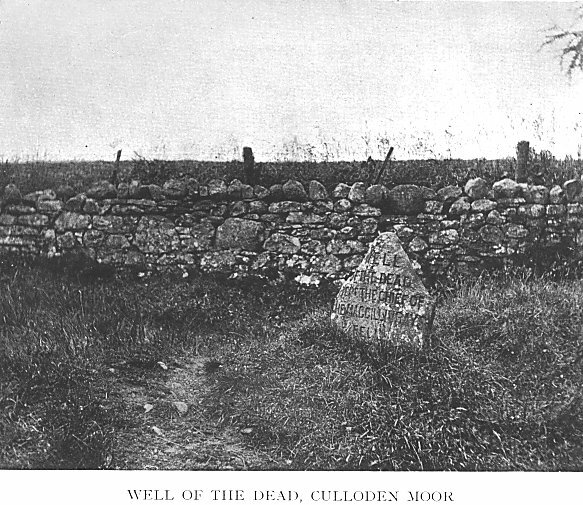 In 1715 the MacGillivray chief and his brother were Captain and Lieutenant of Clan Chattan regiment and at Culloden, Alexander who was in command of Clan Chattan fell fighting against the Hanovarians, near the Well of Dead that bears his name. The last chief John Lachlan MacGillivray succeeded in 1783 and possessed the estate for nearly 70 years. When he died in 1852 his estates were left to his tenants, afterwards the line died out and the chiefship has been dormant ever since. The lineage of Clan MacGillivary Chiefs has not died out. Laclan MacGillivrary's sister Margaret married a McIntosh. Their son was also McIntosh. His son (Margarets Grandson) was Chief William McIntosh of the Creek Nation. (His first cousin once removed was Chief Alexander MacGillivrary of the Creek Nation).